This was my first time trying culinary dried lavender in a recipe, and I must say it did not disappoint! The combination of raspberries and lemon, enhanced by fragrant lavender is absolutely divine. It is like a purple dream come true! or should I say ”lavendream”. I should tell you to pay extra attention to the lavender flowers (or lavender essential oil). Just a little goes a long way, but do not overdo it. Just the right amount makes the cake special. If it is exceeded, the risk of achieving a “soapy” texture is most likely to happen! An interesting(and kinda annoying) thing I discovered is that the lavender flowers won’t actually make your cheesecake purple! So I combined mine with acai powder. Blueberries or berry powder would also work to add a purple hint. The only thing that I find difficult is that good organic lavender flowers are not very easy to find at your local grocery store. Look for it at some gourmet stores or online. This beautiful cake is gluten free, vegan, AND raw! Raw simply means there is no baking involved. I felt the need to explain this because I had a situation few days ago with one of my friends. She asked me for the recipe for one of my cheesecakes and once I told her that the recipe makes a raw cheesecake, she said “Oh no, I don’t eat raw food”. I started laughing and tried to explain to her that raw in this case means there is no baking needed, because I don’t add ingredients that require baking. 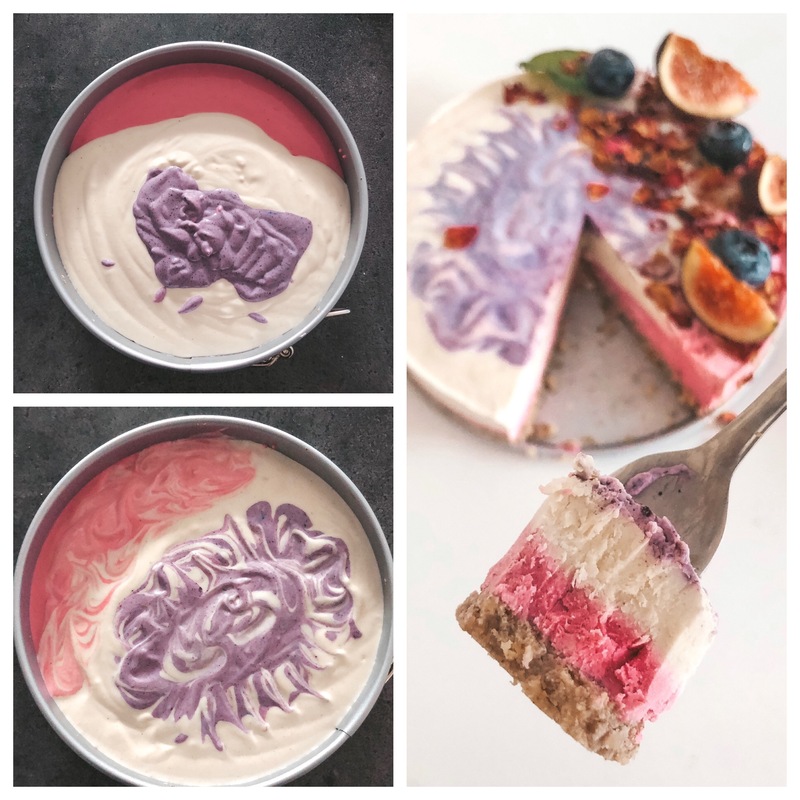 Basically, everything I add in the cake is what we eat on a daily basis, the difference is they are all mixed together in a nice and healthy cheesecake. Hopefully the misunderstanding is now cleared up. Now, back to the recipe and how to make a treat which will have you wanting more. To make the base, melt the coconut oil. Place the pecans or cashews, coconut flakes, almonds, vanilla and salt into a food processor and blend until the mixture looks like chunky crumbs. Add the dates and blend until it’s mixed well together. Now add the melted coconut oil and mix everything together again. Press the base mixture evenly into the prepared tin, then place in the fridge to set. Blend all filling ingredients except for raspberries in a blender into a smooth cheesecake consistency and until lavender is finely chopped. Remove and set aside about 2/3 of this mixture. Add the raspberries to the ⅓ of the mixture remaining in the blender and blend until smooth. Remove 2 tbsp of the the white mixture and set aside for the lavender filling. Mix the lavender filling ingredients together with the remaining 2 tbsp of the white mixture and lightly swirl the mixture with a spoon. Decorate with edible rose petals, fresh figs and blueberries.